A scam involving ATM machines in which thieves insert clear plastic sleeves into the machine’s card slot. When an unsuspecting customer inserts his or her card and enters their PIN, a message instructing the user to reenter the PIN is displayed because the machine cannot read the card’s magnetic strip. After several unsuccessful attempts to reenter the PIN, the user finds that he or she cannot remove their card and, in many cases, leaves the machine mistakenly believing that the machine has malfunctioned and retained their card. In reality, the thief, posing as another customer feigning aggravation over the malfunctioning machine, was able to memorize the user’s PIN following the unsuccessful entries, before leaving the area. After you leave, the thief (or an accomplice) returns to the machine, removes the plastic sleeve containing the user’s card, reinserts the card without the sleeve, enters the user’s password and empties their account. Should you or anyone you know encounter such a scenario, carefully examine the card slot and run your fingers across it to find one or more of the almost imperceptible “prongs”attached to the plastic sleeve that are designed to permit the thief to remove it. Should you be unable to retrieve your card for any reason, do not assume that the machine “ate it". If you have a cell phone, remain at the machine and call the telephone assistance number listed on it. If you are later met by an “ATM repairman”or someone identifying himself as “a police investigator”who retrieves the card from the slot, do not turn that card over to them for any reason, most notably for “evidentiary purposes". Con artists often pose as repairmen, police investigators and even FBI agents; legitimate law enforcement officers will never ask you to turn over your ATM card, credit card, or cash. In one case a bogus female bank employee stood next to an ATM machine promoting a special bank competition in which cardholders were entered into a special draw simply by writing their names on the back of transaction receipts and placing them into a box. Little did they realize that their pass codes where being observed and recorded. 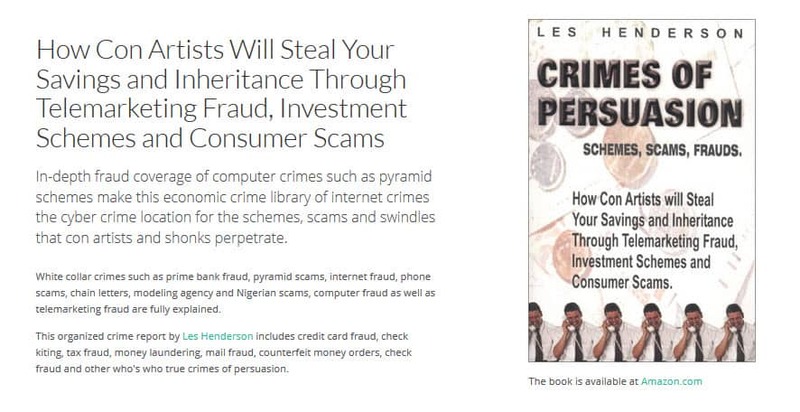 See two variations of an ATM Scam and Lebanese Loop Scam photo Powerpoint Presentation graciously provided by Ted Nicholas, CFE, CFS. Ted is a Certified Fraud Examiner/Certified Fraud Specialist with the First Citizens Bank Limited in Trinidad & Tobago. He also operates a privately owned company TRACER INVESTIGATIONS specializing in all types of investigations. White plastic is a term given to any piece of plastic used as a credit card. Normally, a blank piece of plastic embossed and encoded with a stolen account number is used for fraudulent cash withdrawals at ATM machines or with cooperation by merchants. White plastic is also being used in a scheme called "shoulder surfing" which either involves setting up a video camera or person to record individuals using an ATM. The camera is focused on the PIN pad to capture a customer's PIN or is accomplished by merely standing in a position to see what you type. At the end of the day or periodically, suspects retrieve discarded receipts from around the ATM which contain the account number and time of transaction. Once the criminal has both the PIN and the account number, they can produce a duplicate card. In New Haven, Conn., two suspects opened a fictitious ATM leasing company called Guarantee Leasing, Inc. They rented office space on Park Avenue, New York City, NY, incorporated the fictitious business, created fictitious letterhead, purchased four ATM machines and had the unsuspecting ATM company bill them. Then they contracted a computer programming company to install a computer inside the ATM that would simultaneously capture the personal identification numbers and account numbers of anyone using it telling the computer company they planned to use the ATM and computer at a trade show simply to demonstrate the versatility of the machine. Once the ATM was altered to capture the account numbers and PINs, it was installed at a very exclusive mall in Connecticut where they had disabled other ATMs, by jamming the ports with plastic cards and super-glue, so that all automated banking transactions were steered to their machine. The fake ATM originally dispensed some cash, then merely displayed that it was temporarily out of service. By the time it was "out of service," however, it had captured the PINs and account numbers of many people who had used the machine. The suspects then encoded and embossed the account and PIN numbers they had obtained on counterfeit credit cards, and a shopping spree ensued. An alert bank employee and law enforcement efforts saved the banking industry millions in potential losses because the scammers had mapped out other malls in exclusive areas up and down the entire east coast. The main suspect was a 51-year-old graduate of Brigham Young University with a masters in business administration from Tulane University who had been a corporate planner for a Fortune 500 company and a senior vice president for a bank. The second suspect was considered a computer genius and had an outstanding warrant for wire fraud. Following their arrest, investigation revealed that they had been involved in financial crimes for over 10 years and had defrauded two auction houses in New York City of over $300,000 using counterfeit cashier's checks. Will You Take a Credit Card for Bail? 10/22/02 - Adriana Venunzio and her companion, Jose Granado, were arrested by Boston police and charged with using a data-theft device to steal credit card information and ATM personal access codes from banks by installing a data-stealing device over legitimate ATM card-swipes. They were arraigned on charges of obtaining personal property by trick, receiving stolen property, conspiracy to commit larceny, and conspiracy to commit identity fraud. While Venunzio and Granado were the names used for the defendants in court papers, Assistant District Attorney Taj McCree said that the pair had several forms of identification and that investigators are not yet sure who they arrested. Granado - who authorities said lives in Miami - had a Venezuelan driver's license issued to a Cesar Martinez. The pair moved from hotel to hotel in Greater Boston and spent up to 20 hours a day installing the equipment on ATMs, returning later to collect the device and the stolen data. A bank brought the pair to the attention of police when a usually busy ATM reported no activity for three hours after the device was attached. Boston police said a skimmer similar to the one seized from the pair's rental car can store up to 5,000 credit card and personal identification numbers. Bail was set at $2 million cash each. CALGARY -- Calgary cops are warning ATM users to beware of a sly scam that has bilked Kamloops bank customers. Crafty crooks in that B.C. city are swiping money from customers who wrongfully believe the bank machine they're using has malfunctioned and denied them the cash they tried to withdraw. As the jilted customer leaves, thieves swoop in to remove the cash, trapped behind altered or false ATM fronts. Kamloops cops have received nine such complaints since Oct. 12. Four cases involved false fronts placed over ATM withdrawal slots while five involved the swapping of the face plate on the withdrawal dispensing area of the ATM with a fake one. "It appears face plates have been removed from one bank, and then a sticky tape is attached at the back," said Kamloops RCMP Cpl. Mike Stewart. "The plate is then placed over another similar ATM and when the customer attempts to withdraw money, the cash does not come out. "The money actually did come out, but is stuck to the back of the false plate. The customer then leaves and the suspect comes in and removes the plate and cash." One Kamloops bank machine was hit three times, another twice and four others once each. Calgary Police Service Insp. Bill Sherlock said Calgarians would be wise to take heed of what's happening in Kamloops in the event a similar scam is being used here. "It's a good public alert," he said. Stewart said ATM users should "be very vigilant. "If they have an occasion to try to withdraw cash and nothing comes out or things don't look right, call the bank first and then (police) -- do not leave the bank if possible until the bank or police personnel arrive." U. K. POLICE have issued a warning to cashpoint customers to watch out for for criminals running a cunning scam nicknamed the 'Lebanese loop'. The device is a piece of black plastic with a loop of tape attached. It is fitted over the card slot in the cashpoint machine, with the loop concealed behind it. When a customer tries to use the machine, his or her card gets stuck inside. Many people assume the machine has swallowed their card and walk away, intending to report the fault later. Meanwhile, the fraudster, who has noted the customer's PIN number, retrieves the card from the machine and uses it to withdraw money from the customer's account. Over the last couple of months 'Lebanese loop' crimes have hit the streets of Slough, and police believe they are linked. At Tuesday, October 21, at about 7.15pm, a man tried to use the cash-point at HSBC Bank in High Street, Iver. When his card got stuck he managed to force it out, but a black plastic device came away in his hand. A woman who was standing very close behind him offered to help, but he declined and walked away. Four days later, on Saturday, October 25, at 8.15pm, a woman tried to use the same cashpoint and had a similar experience. Again, there was a woman standing close behind her at the time, looking over her shoulder. The woman suspected of being involved was white, aged 30 to 40, about 5ft 3ins, stocky, with blonde or dark blonde curly hair. She was seen to get out of a blue hatchback car parked nearby, and was accompanied by a white man in his thirties, with a suntanned complexion and athletic build. Also in the car was a small child aged two to five. Slough police's crime reduction adviser Jenny Smith said: "We urge all cashpoint users to look carefully at the machine before inserting their cards, and to be alert to any devices used to block the card slot. Customers should be especially cautious if someone is standing too close during their transaction. "They should check their bank statements frequently and report any fraudulent use to their bank." Anyone who suspects they may have been a victim of a similar scam, or who has any information about the above incidents, is asked to contact the Police Enquiry Centre on 08458 505 505, or call Crimestoppers anonymously on 0800 555 111. Two devices can be attached to the ATM to fraudulently get details of a customer's card and personal identity number (PIN). One device consists of a home-made card reader placed over the existing card-reader slot. The false front card reader is usually attached to the actual machine with two-sided tape. Any bank card fed into the ATM passes through the device which contains an electronic device, known as a "skimmer", which is capable of reading and recording electronic data from the bankcard's magnetic strip. Then a digital camera can be mounted in a metal bar above the keypad and used to record the PIN numbers punched in by customers or a plastic tube containing a camera can be taped anywhere on to the ATM. The devices are visible to someone using the ATM. One scammer who placed a Lebanese Loop on machines over a ten year period would be nearby when a person experienced difficulty. He would then approach the victim and claim that the same machine trapped his card the previous day. He told the victims that they might be able to free their card by re-entering their PIN. He would then watch and memorize the PIN. After the ATM user left, he would remove their card from the machine and use it to empty their account. Would-be thieves counted on bank customers being in a hurry and willing to follow instructions to complete their transactions when a card-reader device was installed at a Maryville automatic teller machine. Roxanne Coffey said in an e-mail to friends that she and her husband, Mike, were in a hurry when they stopped at the First Tennessee convenience branch near the Blount County Library last Saturday. They read a sign posted at the ATM that said: "Due to recent fraud attempts at this ATM machine, we require you to swipe your card in the reader below before using the machine. We apologize for the inconvenience." Mike Coffey followed the instructions, but as he got cash from the ATM, his wife told him she thought there was something wrong. She noticed that the sign giving the special instructions had "appologize" instead of correctly spelling "apologize." When the Coffeys looked more closely at the card reader, they realized it was not firmly attached to the wall. Instead, the reader and the white acrylic sign with black lettering were both held in place with double-faced tape. When Mike Coffey gave the reader a tug, it came loose from the wall. The Coffeys used their cell phone to call the First Tennessee customer service number while they were at the ATM, and their suspicions were confirmed -- the card reader was not placed at the ATM by the bank. The customer service representative asked the Coffeys to bring the device to the bank's main office on Monday, and they complied with the request after removing the battery in the card-swipe device in case it was capable of transmitting information to a remote computer. They also canceled the card he swiped through the device. First Tennessee Regional President Tony Thompson commended the Coffeys for reporting the situation and bringing the device to the bank. He said it was turned over to the security division and the situation is being investigated, both by the bank and by law enforcement. Meanwhile, Thompson urged customers at First Tennessee and other area banks to be alert for anything unusual at ATM locations and to keep a watchful eye on activity in their accounts. The small card-reader device apparently can be purchased via the Internet for legitimate uses. However, it could also be used to obtain information about ATM and credit card accounts, then the information could be used to access those accounts. The battery-operated device stores information from the cards swiped through it, and the information can then be downloaded into a computer. Thompson said when there is a problem with a First Tennessee ATM, the machine is shut down. There are never "special instructions" for operation. Other local financial institutions use the same procedures. Thompson said there is a 1-800 customer service number on the back of First Tennessee ATM cards, and the local customer service number is 977-5205. "Anytime something seems out of the ordinary at one of our ATMs, call customer service and ask about it," he urged. 01/05 - Ireland - Police today issued a warning to bank customers after a scamming device was found attached to an ATM in Londonderry's city centre. The device, which is believed to be used for copying cash card details, was discovered at a bank machine outside a Strand Road hotel on Wednesday afternoon. It is believed to be the first time such a device has been found in the North West. Two women victims were identified within 10 minutes of each other. A PSNI spokesman said today: "One of the women spotted the device and removed it but it was snatched from her by two men who ran off." (Australia) - 3/06 - QUEENSLANDERS have been hit for the first time by a sophisticated automatic teller machine scam which the banks have so far proved almost powerless to combat. Police have warned that the latest scam detected in Brisbane would be just the first of many hi-tech attempts to empty consumers' bank accounts. The scam works by attaching an electronic device to the ATM slot which "reads" a customer's debit card details, and electronically copies those banking details for later use. The scammers typically peered over consumers' shoulders or "shoulder surfed" to obtain PINs, although more sophisticated systems can include a pinhole camera or fake keypad. The data is later encoded into a blank card which is used to siphon money from unsuspecting customers' accounts. Queensland Police were alerted to the scam on February 21 after a man noticed and removed a device attached to a Suncorp ATM in the Myer Centre and was quickly accosted by three men who stole the device back. Detective Acting Inspector Graham Clark, from the Fraud and Corporate Crime Group, warned the Myer Centre incident was unlikely to be a one-off. "It's been utilised interstate but it's the first recorded incidence in Queensland of card-skimming," he said. "The way the technology is, and is becoming available, I think we will see more of it in the future." Insp Clark said this particular attempt to skim debit cards appeared to have been amateurish as the device was stuck to the machine's card slot with double-sided sticky tape. He said sophisticated debit card scams were difficult to identify and, if the scames were executed successfully, consumers would only know they had been fleeced when "something irregular appears on (their bank) statement". A Suncorp spokesman said no customers had money stolen from their accounts as a result of the scam, and people who had used the ATM had been contacted and offered new debit cards. Australian Bankers Association chief executive David Bell said customers would not be held liable for "losses resulting from unauthorised transactions, where it is clear the customer has not contributed to the loss". But QUT electronic business law senior researcher Adrian McCullagh said the incident was likely to be the first of many ATM skimming scams, which could cost the community millions of dollars once skimming devices became more commonly available. "If something's not done now, in four years' time it will be a major, major problem," he said. "Once it starts in one area, you will then see there is going to be an ever-increasing incidence of these types of criminal activity." Dr McCullagh said banks could move to stop the theft by introducing "smartcards" with a computer chip recognised in ATMs, but were reluctant to do so while it cost less to reimburse consumers' losses. He said the top six banks made a profit of $11 billion in 2004, and could roll out smartcards over two financial years at a cost of $700 million, or just 3 per cent a year. "Doing a cost-benefit analysis, it probably doesn't really make sense for them yet," Dr McCullagh said. "But the problem with that is that it is the poor customer who gets hit with these illegal transactions and has to establish to the bank's satisfaction that the transaction was illegal." RMIT information security program leader Dr Asha Rao said banks were likely to suffer more significant card-skimming losses in future, though, as "organised crime gangs" took over from "kids with too much time on their hands". She said ATMs with card-skimming devices attached often looked no different to ordinary ATMs, but consumers should pay particular attention to the machine's card slot and monitor their bank statements for irregularities. Police are seeking two men of eastern European appearance and a caucasian man with a goatee beard in connection with the skimming attempt. 01/07 - FOUR members of an international crime syndicate have been jailed for their part in a $1.6 million scam that used skimming machines in Sydney ATMs to drain Australian bank accounts. The group, who travelled to Australia from Canada on tourist visas, were part of a "highly planned and organised scheme", planting the devices at automatic teller machines (ATM) in the city, the District Court heard today. The four, Svilen Marinov, Gueorgui Dinkov, Assen Dotchev and Christo Sotirov, were not leaders of the criminal syndicate and became involved in the skimming scam out of financial hardship, the court was told. The court was told the four men were responsible for stealing a total of $60,000. Up to seven others involved in the scam had fled Australia, the court was told. "(The men) were involved in a highly planned and organised scheme to defraud financial institutions in New South Wales," Judge Christopher Geraghty said. "Their role in this particular scheme was not at the top of the hierarchy. "It seems to me that they were active over a period of time, participating in the scheme of fraud but they were not principles." The four men were arrested in September 2005 following a police investigation into the manipulation of ATMs in Sydney. The men admitted to attaching a skimming device, the same shape and size as an ATM card slot, to the machine which would record the details on each card entered. The men also attached a camera to the machine in order to record bank customers entering their pin numbers. The information was then duplicated onto a new ATM card and the accounts were accessed at ATMs, with the thieves withdrawing as much money as the bank would allow on each visit. The men would often access the accounts close to midnight and then shortly after in order to withdraw the maximum daily amount twice. Much of the money was sent to overseas bank accounts. As many as 500 bank accounts were accessed by the men, who had pleaded guilty to dozens of fraud-related offences. The four were initially charged with 197 offences but that figure was downgraded, with the group today sentenced for dozens of charges relating to having and using implements for making false instruments. The men, three Bulgarian nationals and one Czech citizen, had been "preyed upon" and were in financial trouble when they agreed to travel to Australia to take part in the scheme, defence lawyer Barry Murphy said. Although the men were meant to receive a 20 per cent cut of the money they stole, Mr Murphy said none of them made a "great profit". "The whole thing's been a great disaster," he said. "(It was) known by organisers that they all had financial problems." Dinkov was eligible for release today after Judge Geraghty backdated his 16-month non-parole period to the date of his arrest. It was expected the 29-year-old would be immediately deported. Marinov, 29, was jailed for 22 months. He will be eligible for release in July this year. Dotchev, 23 and Sotirov, 46, were jailed for 18 and 20 months respectively. With time already served, both men will be eligible for release later this year. 01/06 - MANAMA — Bahraini authorities yesterday arrested two Bulgarian men that had managed to steal hundreds of thousands of dollars as part of an organised-crime ring that targeted cash- dispensing machines in the Gulf and Europe. The two men are believed to be connected to groups in Bulgaria suspected of targeting automatic teller machine (ATM) card holders also in Europe, Qatar and other Gulf states, sources said. “The two men were arrested after a six-month investigation,” one source, who spoke on condition of anonymity, said. The thieves had used hidden cameras and false card-reading devices placed over the ATM in several banks to capture, or “skim,” data stored on the cards’ magnetic strips. They later returned to the ATM and used the skimmed data to withdraw money from the victims’ accounts. “They had been travelling back and forth. They return every three weeks to carry out their crime and later leave the country,” the source said. An official at one of the banks that had been hit hard by the thefts confirmed reports of the arrest. “We are pleased that they have been arrested,” the official said on condition of confidentiality. “The Bahraini police, and in particular the crimes unit at the Criminal Investigation Directorate, has done a magnificent job in identifying and tracking these men,” he said. Officials in Bahrian would not comment on the exact amount of money that had been stolen, but unofficial estimates put the number in the hundreds of thousands of dollars. According to the 2005 EU Organised Crime report, Bulgarian crime syndicates are heavily involved in currency and document counterfeiting, payment fraud, exploitation of prostitution and property crime, including car and home-jacking. The report also said that the Bulgarian gangs have become prominent in the field of illegal adoption with indicators that suggest their involvement in global child trafficking. The Global ATM Security Alliance said that electronic methods of ATM fraud are six times as likely to happen as physical attacks on the machines.